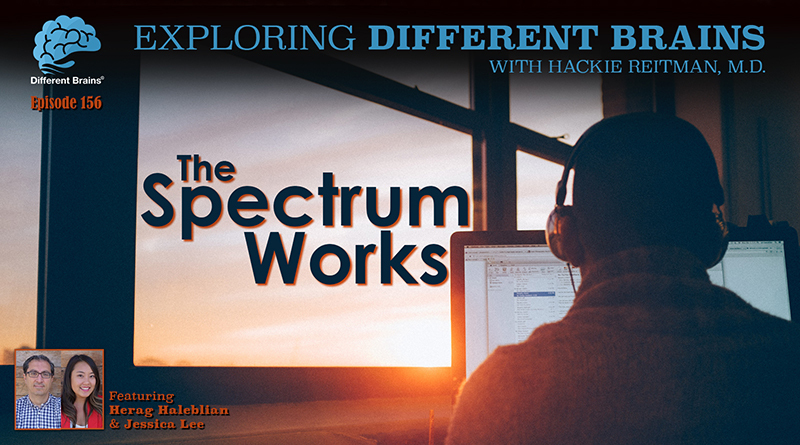 In this episode, Dr. Hackie Reitman speaks with Herag Haleblian and Jessica Lee of The Spectrum Works. HACKIE REITMAN, M.D. (HR): Hi, Dr. Hackie Reitman. Welcome to another episode of Exploring Different Brains, and today, we’ve got the people from this great organization Spectrum Works, and we’re going to hear all about it, and we’re going to start out with Jessica and Herag introducing yourselves. JESSICA LEE (JL): Alright, thank you, Hackie. Thanks for having us here. We’re so excited to join this podcast. My name is Jessica Lee, and I’m one of the co-founders of The Spectrum Works! HERAG HALEBLIAN (HH): And my name is Herag Haleblian, I’m a co-founder as well of The Spectrum Works. I’m a consultant, but this is a venture that we’ve started, and we’re working together on this and really excited to see it moving forward. What is The Spectrum Works? HH: Alright. Tell our audience what it is that you and your organization do. JL: So The Spectrum Works, our mission is to transition gifted individuals on the autism spectrum into employment, meaningful employment, and jobs at corporations across the United States, and, you know, the purpose of this is that when you look at the unemployment rate, it’s at 80%, which is increasingly high, and as, you know many people know, and other guests you’ve had on the podcast, individuals on the spectrum have so many abilities and talents that corporations can really leverage and bring tremendous value to the workplace, and we want to be that bridge to help transition individuals on the spectrum into corporations by approaching and partnering with corporations to do this. HR: How do you build these bridges? How do you go about it? HH: Our focus is, you know, we’re very corporate focused. We’re starting with the corporation first and, just like you said, helping them understand the value of neurodiversity. I mean, we’ll tap into the social consciousness of the corporation, work with HR and Diversity and Inclusion Departments, but ultimately, we want to explain to the the organization, the company, that, “Hey, listen. This is an untapped resource pool that if we do the right matching, find the right individuals, and find the right accommodations, and do this right, you will gain a lot of benefits, and they will bring to the table certain attributes and skills that your neurotypical workforce may not have,” so we are balancing being a social conscious company, yet this is just good business decision. JL: They can reach out to us info@thespectrumworks.org and we would gladly speak to them and start, you know, what we’re doing is kind of on both ends: Trying to build partnerships with corporations, that’s where we start, but we’re also a portfolio of potential clients who we can help transition and match to these corporations and to these jobs. One of the things that we are doing is speaking with many autism experts about, you know, which jobs may be the best fit to start with in corporations. We truly believe that individuals on the spectrum are capable of all types of jobs, but as, you know, another colleague has said, “There’s some low-hanging fruit at corporations.” You talked about SAP and Microsoft. It’s been proven in the tech space, but there are so many other jobs that could be a great fit, in accounting, in graphic design. There’s so many different skill-sets and abilities and so we’re really trying to hone in on where we start, but we absolutely love to talk to individuals who are on the spectrum and their family members to learn more about their experience, to really make sure that we’re tailoring this fit to their fit also. HH: And I think that this question is very appropriate, Hackie, because we’re not like many other autism organizations that have a set of individuals that they’re supporting and then ultimately trying to find employment. We’re just working with the corporations, finding the jobs, and then we’re hoping to leverage our network of the autism community to find our resources, so we are… that’s why a podcast like this is very helpful, so we want to expand that network as much as possible as we start finding more jobs that we would be able to find more candidates to make available to the corporations, so that’s how we plan on doing it. HR: Where do you draw the line, if there is a line, on the various gifts and talents that you’re talking to the corporations about? For instance, I once was giving a talk at FAU, Florida Atlantic University, to a couple of hundred people, and I was showing a slide of Rising Tide Car Wash down here, which is a car wash franchise that got started by a parent and son, whose other son is on the autism spectrum, and they only hire autistic individuals, and I’ve taken my truck there, and they do a great job. One women raised their hand, said, “My son is gonna interview with Microsoft. I think that washing cars is beneath our kids,” and that’s when I show a picture of my parents’ gas station in Jersey City, where my mother used to pump gas and my father was the mechanic, and there is a spectrum here, and how do you address that, and what are the types of corporations? Is it, to a layperson might think, “Oh, it’s just all technology?” But give us an insight into the corporations you’re dealing with. HH: Oh yeah, I think, what we say is we’re trying to expand the spectrum of works, of jobs available for people on the Spectrum, right? So there’s definitely a lot of organizations trying to find blue collar work, which is great. That’s needed. Maybe another of the things that we’ve seen recently is entities that start that just hire autistic adults. Our goal is to really push that spectrum to corporate, white collar jobs, fully integrated, right? So that’s kind of what we’re thinking, and this is not that one is better than the other. We believe there should be different models, and the people on the spectrum should have choices. We’re just adding another choice. We’re not competing with other models; we’re supplementing the other models, and hopefully some of the people can navigate between these models, right? And as we provide choices, our focus is corporations, white collar work; that means any corporations, so we’re not limiting to technical companies, and so, we’re trying to understand or research what jobs may work in a general corporation so we can help the corporation identify the right departments and the jobs that may be available to them. So, yeah. JL: And I think what’s been really inspiring and encouraging to see is at other corporations where they have started to do this, that the quote-unquote “accommodations” for the individual on the spectrum is actually good for everybody. It’s made managers better managers because they’re, you know, managing to the individual needs of their employees, and that’s better for every employee that steps into a job. So you really see that the benefits to the business far outweigh… I mean, first of all, they’re a good fit for the job. They have the skills and abilities and even may have… be better at a certain job but also that it raises the culture of the company and it improves so many other processes of the organization as well, so this is a true business value decision. HR: That’s great, and do you go in and educate the managers in the company? HH: That is one of the keys, right? In addition to helping a corporation understand the value of neurodiversity, we want to educate the organization on multiple levels, right? There may be different education programs that you may need for HR departments. There are certain things that they need to understand. Well, we definitely want to help with the organization, the department, maybe even the coworkers, right? If we’re going to pay someone, we may want to provide education training to the coworkers to help them understand what is autism, what’s some of the things that they may have to do to be able to handle maybe some of the accommodations – right? – so to understand why we’re even doing accommodations, and so, the idea disclosure becomes – I know this is an interesting topic in the autism community – but I think our model kind of assumes disclosure because those are the things we would love to do, right? We would love to make sure that we have an open environment and we make sure… our goal is really to create an environment in the corporation that once the individual comes in, they will be successful, so education is definitely a key part of that. HR: Can you take us through the whole process from the first step to the last step that your company does with the employer? JL: The first step we do is… First, we seek out corporations and so far, it’s just been from networking, from word-of-mouth, friends that we’ve met… so we start with corporations, and, you know – we’re calling them “internal champions,” so – individuals who are meeting at corporations when we share with them about what we’re doing, they say, “Hey, I think our company could be a great fit for this,” and we tend to see this in corporations that have diversity and inclusion initiatives where they’re already working in the workplace to build more equity, and so that’s a great launching pad for us, so we go, we talk to corporations, and we meet with those “internal champions,” and they may also bring in someone from HR, or there are some companies that have diversity and inclusion officers, and we’ll have a meeting with them, share with them about what we’re doing, why this is important, and from there, talk about okay, you know, “Which jobs may be a good fit in your corporation for somebody who’s on the spectrum?” Here’s a lot of the abilities that they have at a high-level generally and sit with them to really brainstorm which jobs may be the best fit, and from there, we move into actual talking about, “Okay, if we have a job that we want to hire for, how would we make a accommodations, even in the interview process?” Because a lot of times, what we’re seeing and hearing is that that’s one of the most challenging pieces. Interview processes today are set up to gauge so much of these social interactions and cultural fit, which is important, but interviews processes should also really be focused on “Does this individual have the skills and the abilities to do the job?”, not just the social aspects of it, so “How can we make accommodations in the interview process?” and then from there, placing them into the job, what workplace accommodations they may need… We really are going to look to rely on our partners in the autism community to help with, you know, the other surrounding services for an individual such as, you know, independent living and housing and transportation, coaching, job coaching, that there are so many services out there already, and we’re in California, so there… the regional centers, and there’s a lot of resources on that end, and we really look to partner with people to help provide those wrap-around services, but for us, placing someone in a job is not enough. We really care about sustained employment, so really evaluating helping that person to navigate what they may need to in the workplace but also partnering with the manager and the corporations to help them to know, you know, be a coach and a support to them on an ongoing basis as well. HH: So, we’re definitely, obviously, very corporate focused, really enabling the corporations to be neurodiverse, yet we… it’s not just pure consulting and helping them figure this out but really be hands-on and help them hire and go through the whole process and providing ongoing support. HR: And, so your job does not end when the job is achieved. HR: You stay right on the case. JL: And we want to make sure that programs are set up correctly in the workplace to really help foster this person’s success, which again, we think helps everybody in the corporation and not just that individual. HH: Yeah, and another idea that’s been coming is, you know, develop a career path of an individual withing the corporation, right? You may not get them at the right level. Start them at an entry level, maybe a blue collar level, but stay on top of that and work with the corporation and say, “Hey, we want this individual to move up the chain, right? To the level they need to be.” The ongoing support is also that, to make sure that they’re in the right level of of job that they deserve. HR: What’s the biggest roadblock that you’re hitting? JL: One is really being able to change perceptions about what is autism and what that may look like for an employer, but I think that educating is the biggest key to that and raising awareness. I think people have certain stigmas that they may attach, or that are false, and it’s really being able to talk about those things in an honest and open manner. I think that’s one barrier that we face. HH: Yeah, and that is changing perceptions. I mean, changing perceptions is not an easy thing. You really have to address it, and it takes a long time, so I think our venture requires patience and time, and it’s not an easy thing, right? So that people have to understand that and then we understand. HR: Is it only autism? HH: We’re starting with autism, but obviously this can lead to other areas, right? And you know, areas that are kind of similar to autism that have also been discriminated against. HR: Well, plus, nothing occurs in isolation anyhow. HH: And we really don’t want to be black and white – right? – only white collared. Say if a corporation has some blue collar work that fits, hey, we’ll do that as well, alright? We’re just trying to stretch the spectrum and challenge the models here, but we don’t want to be narrow-minded here. HR: What’s the biggest misconception that you run into? I know we have to change perceptions and everything, but is there any one big misconception out there that somebody like me might not know about? HR: And you’re getting the proper support from your partners in the community. JL: Right. And we’ll be a support for them, and actually I think once we start to talk about it, they start to realize… these manager start to realize and have this “A-ha!” moment of “Actually, I have to manage to my individual employees already, right?” There are already some employees that, you see them in an interview process, and you said, “Wow, they interviewed so well, but now that they’re in the job, they’re completely different,” or, “There’s other things that they need and more that I have to do as a manager for that employee,” not any different here, and actually even better that in the interview process with our candidate, you’re going to get what you see, you know. There’s no hiding because they’re blunt, and that’s actually very refreshing, I think, personally. And so, I think it’s having this conversation to start to give new perspective. HR: What can people in our audience do to help you and your organization achieve you mission? HH: Well, I mean, I think, what we said earlier… we definitely need a strong network, right? We’re not going to do everything… if there… for example, supporting the workforce readiness training and so forth, or coaching… we don’t want to recreate the wheel here, right? If there’s already something being done for the individuals, we definitely want to focus on the corporation, so I think building our network, having good relationships with the autism community and others organizations that we’re going to have to rely on, I think, is key. And hopefully, podcasts like this is very helpful, so we’re definitely looking to have a strong network, because if we find, let’s say, a job at a corporation and there’s several jobs and then we don’t have candidates, oh, okay then, now that’s, that’s a failure. So what we’re counting on if we build it, they will come, right? If you find the jobs, then the resources will be there, right? So those types of things I think we’re going to have to rely on the autism community. HR: Are are you, uh, at this point and time in your development of your company, is it more local than national? JL: We’re starting in Southern California and the West Coast, but you know, we’re open to all around the US, around the world, I mean, but we are starting here. HH: Yeah, we did it geographically because it does require a strong network, right? We need to build a relationship with the autism community. Yeah, you can do it at the national level, but we feel like it’s it’s better at a regional level, and Southern California is a pretty big region, right? So I think the expansion I foresee being a regionalized expansion, right? So we wouldn’t become a national organization, but we would replicate this at other regions, right? And do the same thing there, right? And kind of how we’d do it with that, right? Because I do feel that regional feel of getting your resources through the different organizations and the support structure and creating that network is essential. HR: How can our audience find out more about you? JL: Well,you can find us on our website thespectrumworks.org , you can also find us on Facebook, Twitter, and Instagram as @thespectrumworks. HR: Now is there anything we haven’t covered today that you guys would like to cover? HH: I think maybe share where we are, right? We are a new organization. We’re doing this part-time, so we’ve been trying to find time – we’re consultants in our day jobs – and we’re working with several corporations now piloting our model, making sure that we get a better understanding of how this works but also at the same time, we’re trying to do our funding so we can actually do this more full-time basis. We’ve come to the conclusion that this is not something that will be sustained on a part-time basis, so within… in 2019, were hoping to transition to more full-time, at least one of us, maybe a couple of us, to be able to really make progress, right? This slow start was really by design to make sure that we got our vision right, we got our approach done right, that we really understand from the autism community what’s the needs and how we go about it, but we feel confident now that our pilots are moving forward, and we’re hoping in ’19, we will actually have several successes, that we will build on top of that, and actually kind of going to full operational mode in the year or two – Right? – that we’re doing this in a much more rapid pace. JL: And to add to that, in order to do that, we also need individuals who would be willing to partner with us, invest in us by donating, help us to be able to transition to this work full-time. HR: Well, Jessica and Herag, it’s been a pleasure speaking to you again. Thanks again for all that you’re doing, and keep up the great work. We’ll see you next time. JL and HH: Thank you, Hackie! 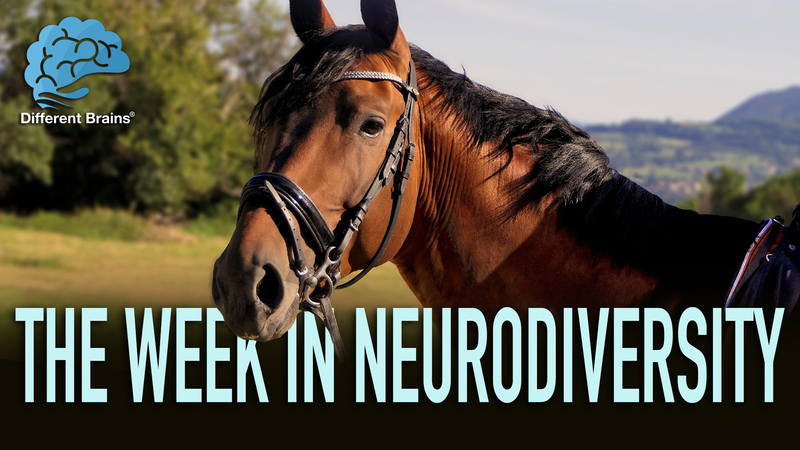 (3 min 36 sec) An Indiana police department looks to keep children with autism safe, a boy with Tourette’s finds that animals help his tics, and what are “zombie cells” and how are they helping the battle against Alzheimer’s? These stories and more in this week’s edition! 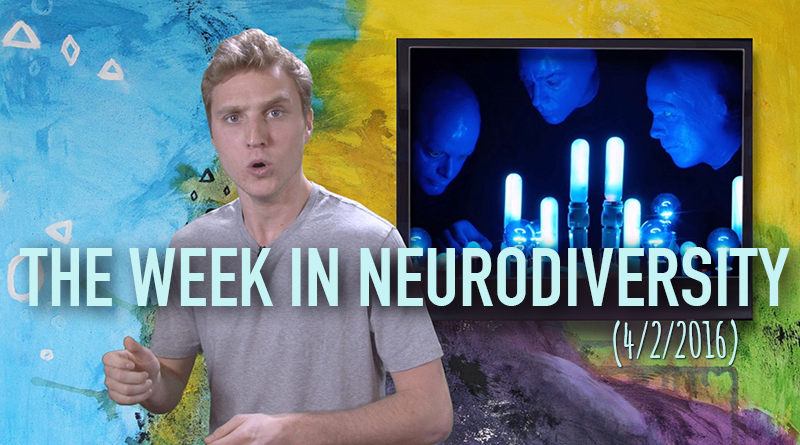 The Autism Acceptance Day edition of the Week in Neurodiversity highlights recent news stories that speak to the differences in our brains.Hosted by Matthew Ryan. 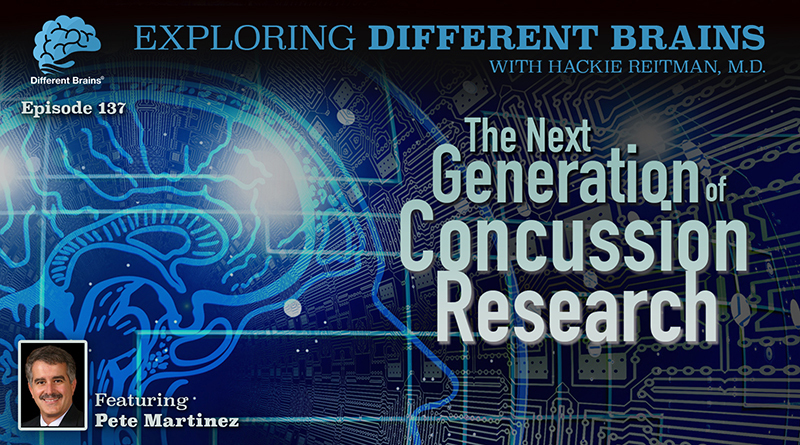 (18 minutes) In this episode, Dr. Hackie Reitman speaks with Pete Martinez, the CEO and Chairman of SIVOTEC Analytics about their research into concussions and CTEs.